What better way to celebrate the birthday of such a beloved writer of children’s books than reading to a child? Dr. Seuss epitomizes a love of children and learning. His use of rhyme makes an effective tool for teaching young children the basic skills needed to be successful in an ever changing world. When we celebrate Dr. Seuss and reading, we send a clear message to our children that reading is fun and important. MANATEE COUNTY TEACHERS CLICK HERE TO REGISTER TO RECEIVE A VOLUNTEER READER. 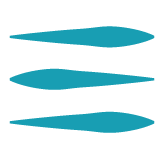 SARASOTA COUNTY TEACHERS CLICK HERE TO REGISTER TO RECEIVE A VOLUNTEER READER. Every teacher must individually register for this opportunity no later than Friday, December 21, 2018 or until all available reading times are filled, whichever may come first. Participation is strictly limited and registration may be stopped prior to the aforeasaid date. Additionally, due to the number of anticipated particpants, we will NOT be able to change the times you will select below for the volunteer to arrive at your classroom. Book selections below are designed to stimulate conversations regarding diversity, bullying, character education, and respect for others. Pre-K – My Many Colored Days – Using a spectrum of vibrant colors and a menagerie of animals, this unique book is a wonderful way to talk with children about their feelings. Kindergarten – The Cat in the Hat – The children learn how to be "upstanders" against The Cat and his scheming tricks. 1st Grade – Green Eggs and Ham – All about trying new things, when those things seem strange and unappealing. 2nd Grade – Horton Hears a Who – After hearing a cry for help, Horton vows to protect the Whos. 3rd Grade – The Lorax – Dr. Seuss pleas for the planet. For more information, please contact Brenna Wilhm via EMAIL. 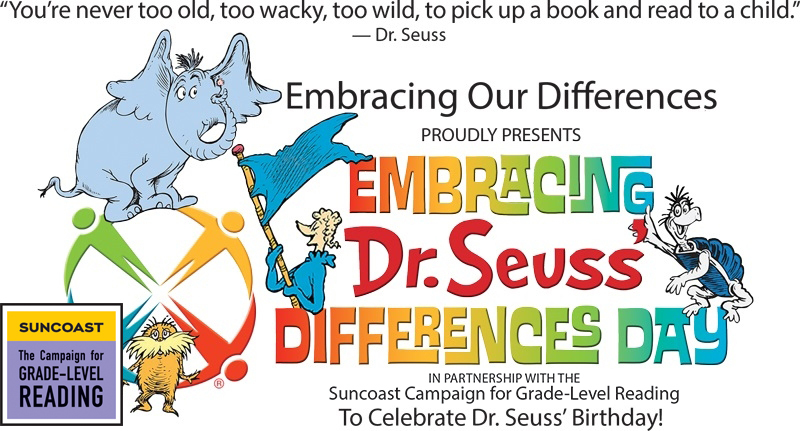 For the past six years, Embracing Dr. Seuss' Differences Day has touched the lives of tens of thousands of elementary school students throughout Sarasota and Manatee counties. The objective has been to mark the birthday of Theodor Seuss Geisel—and to carry on his message by stimulating student-mentor conversations about diversity, bullying and respect. In 2018, with the help of 350 volunteers, this initiative reached 6,700 students from 47 elementary schools and provided more 7,000 books for students and classrooms. This massive outreach reflects a collaboration between EOD and the Suncoast Campaign for Grade-Level Reading, a joint effort supported by The Patterson Foundation, the Community Foundation of Sarasota County, United Way Suncoast and an anonymous family foundation. The program’s profound impact earned national honors when the Campaign for Grade-Level Reading recognized it as a “Best Event” at its All-America City Awards Ceremony in 2016. Dr. Seuss TM & © Dr. Seuss Enterprises, L.P. All Rights Reserved. Dr. Seuss Books Copyright © 1995 - 2016 Random House LLC. All rights reserved.